What does the Charlene's Kitchen staff eat? Turkey burger with spinach pesto, lettuce, heirloom tomato, and Sriracha mayo. Charlene is obsessed with fresh heirloom tomatoes in summertime and loves to get a variety of colors and sizes from the farmer's market! Hot dog bar with assorted fixings. With the hot dog bar everyone can make their own dogs the way they like them and even mix fun flavors together like avocado and mustard! Mini turkey burger with Pennsylvania relish, onion, tomato, and cheddar cheese. Homemade pizza with lobster, reggiano cheese, tomato, zucchini, garlic, shallots, and shiitake mushrooms. Veggie burger with avocado, cherry tomatoes, basil aioli, and an over easy egg. 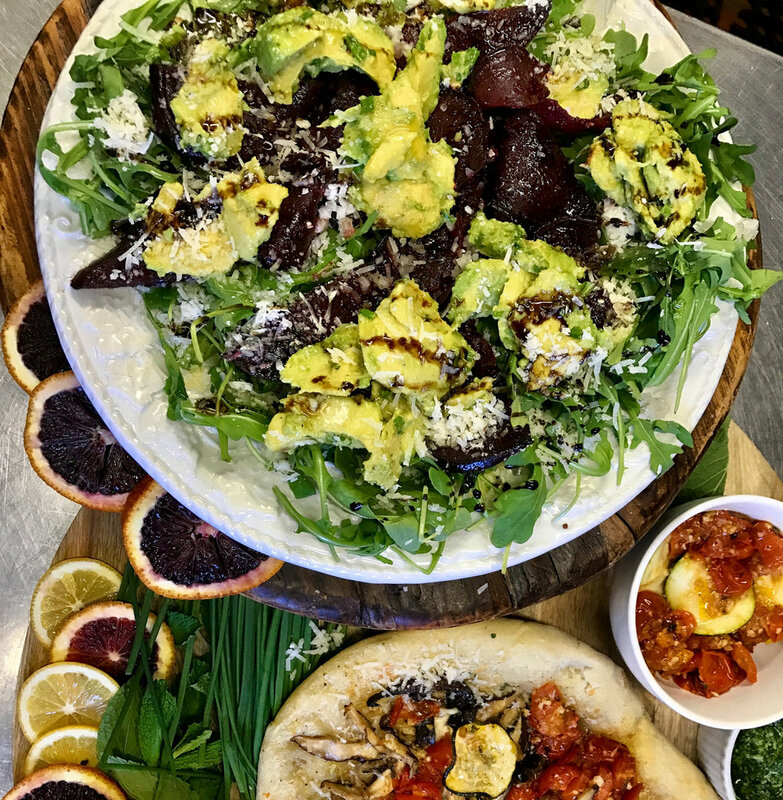 Mixed greens salad with avocado, roasted beets, reggiano cheese, arugula, chives, shallots, and balsamic drizzle. The perfect dish to go with our homemade pizza! Bacon-less BLT with tomato and pea shoots. Light and refreshing and perfect for our resident vegetarian, Denaya! 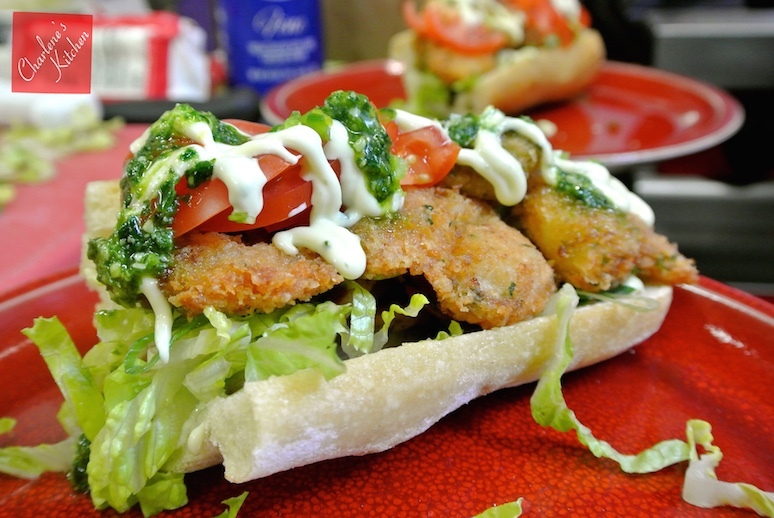 Po'boy with breaded shrimp on a ciabatta roll with lettuce, garlic aioli, spinach pesto, and tomato. Just looking at this picture made us crave these shrimp po'boys again! Yet another turkey burger with bacon, spinach, and cheese. If you can't tell, we love turkey and veggie burgers! Denaya, a Charlene's Kitchen employee for over five years now, always looks forward to lunch at Charlene's as the highlight of her day. She recently cut meat out of her diet and has still found delicious options to eat. Just last night she took a vegan crumble lasagna home to her family and came back this morning raving about it! Even though it's vegan, the meatless lasagna is loved by some of the biggest meat-lovers out there! We have an exciting project in the works- stay tuned for upcoming opportunities this summer to eat like we do at Charlene's! We are also now on Twitter! Follow us @charleneskitchn!